Last week, the Seattle City Council Budget Committee reviewed SDOT funding for 2018, and some members appeared ready to reconsider city funding for the Center City Connector. The Mayor’s budget proposal would finance $50 million of the projects $177 million capital cost via bond sales backed by Commercial Parking Tax revenues. Another $14 million is funded via utility funds, with the balance from other sources including $83 million in federal grants. To amend the Mayor’s budget, the first procedural step is a “green sheet” sponsored by three Council Members (so called because they were once printed on green sheets of paper). In a lengthy Committee discussion last week, Lisa Herbold, Kshama Sawant, and Kirsten Harris-Talley all appeared likely to support such an amendment. The deadline for submitting amendments was on Thursday, October 19. The green sheets were published this morning ahead of a 9.30AM meeting of the Budget Committee. No proposal to reduce or delay Connector funding appeared. This moves forward the Mayor’s proposal to fund the streetcar as the budget is finalized over the next four weeks. There was no comment at this morning’s meeting why members hadn’t introduced a green sheet proposal. Instead, CM Mike O’Brien introduced a Statement of Legislative Intent to extend additional funding for “speed and reliability recommendations for the South Lake Union and First Hill streetcar lines”. The SLI is co-sponsored by Council Members Sally Bagshaw, Lorena González, Rob Johnson, and Kshama Sawant. SLIs do not specify funding levels, but indicate a policy direction that Council Members wish for staff to evaluate. The O’Brien statement is responsive to concerns that, despite running in exclusive right-of-way through downtown, the reliability of the Connector could be harmed by the ends of the line running in shared right-of-way in South Lake Union and on First Hill. The Center City Connector is scheduled to open in 2020 and will carry 25,000 average weekday riders. It will connect the existing South Lake Union and First Hill Streetcar lines with five-minute headways on First Avenue. The locally preferred alternative was selected in 2014, and recommended for $75 million of federal Small Starts funding in 2016, $50 million of which has now been appropriated. The remaining $25 million is included in appropriations bills in both the House and Senate. In other news of interest to downtown mobility, CM O’Brien introduced an amendment to SDOT’s budget to fund a $200,000 consultant study of traffic diversion onto downtown streets when the SR 99 tunnel opens. The SR 99 tunnel will be tolled, and the tolls may divert traffic that currently uses the untolled viaduct to move through downtown. The study would explore options including pricing downtown Seattle exits so that transit service continues to operate reliably. Modeling has suggested a negative impact to downtown congestion and to transit travel times if diverted traffic is not managed effectively. The SR 99 tunnel opens in early 2019. Not even Link Light Rail gets 50% fare recovery. Other than a small handful of urban Metro bus lines (and maybe not even any line, but just some peak runs), no transit in the state gets better than 50% fare recovery besides Washington State Ferries, which is mandated by law to get 80% fare recovery, and does not partipate in PugetPass or ORCA LIFT. If the streetcar is to improve fare recovery, it would first have to go flat-fare and charge the same as Metro. In practice, neither “line” will be long enough to charge more than the minimum fare (which uses the Link distance formula), so the fare will be flat anyway, just lower than it needs to be. Yes, I’m aware that the 56% fare recovery rate SDOT has incorporated into their operational cost structure is based on nothing more than fantastical thinking. 1) Lots of people will take transit trips along this route. This actually quite reasonable. Lots of people take the bus a few blocks north or south in downtown. Not as many as they forecast, but still, not a crazy prediction. 2) There are no alternatives. This is the part that is pure fantasy. If they build this, there will be a center running bus line through the heart of the city. Of course other buses will use this. It is quite reasonable as a path for the RapidRide+ versions of the 70 and 7 (Corridor 3 and 7 listed here: https://seattletransitblog.com/2015/12/21/rapidride-the-corridors/). This would mean that the only unique part of this line would be the First Hill part. This would kill ridership on the streetcar, just by diluting ridership on the downtown section. No one would turn down a bus (going to the exact same spot) to wait for the streetcar. Improving headways improves ridership, but not when you get below five minutes per trip, and this would be well below that. You would have to run the streetcar way more often than the 7, which would be nuts, given that way more people ride the 7. The fare recovery rate is based on the ridership projections, which are based upon the assumption that this is a unique and popular route. But the parts of the route that are unique aren’t popular, while the parts that will be popular won’t be unique. Actually, that’s not correct. C-Tran’s express service has a 62% farebox recovery. Except for the 105 it only runs at peak hours, and the fare is a dime less than $4.00 each way, so it’s definitely “cherry-picking”, but it is relatively successful. I’m highly suspect that the extension will increase operating costs by just 50 percent. The routes have twice as many stops and twice as much length to them! Even with any sort of signal priority and exclusive lanes, it doesn’t meet any test of reasonableness. Let’s also not forget that the system headways are not all yet at 10 minutes either, so that will also add to operating costs. They need to spend a little bit of money to audit the project financial assumptions as well as the ridership before they go any further. Al S. I totally agree. This seems really warranted in light of the questionable assumptions that SDOT has made with regard to ridership, fare recovery and ongoing operational cost support from ST. Additionally, I’d love to hear how this project bloated from the $115 million estimate given in the 2014 Evaluation II analysis (escalated to 2017$) to the $166 million figure (not including utility work) we are being given today. I certainly would! Getting to ride a streetcar instead of having to put up with a bus is definitely worth a few extra minutes’ wait. Besides, I’m always going to know where the streetcar is going, but for any random bus which happens to stop by, I’ll only know that it is going to the “exact same spot” if it happens to be a route I’ve looked up recently. So, I likely wouldn’t feel confident getting on a bus instead of a streetcar, even if the streetcar were going to be 10-15 minutes’ wait. The handful of times I’ve tried just hopping on a bus which seems to be going in the right general direction, I’ve generally regretted the impulse. The tunnel probably shouldn’t be tolled until after the CCC opens. It doesn’t make sense to divert traffic onto downtown streets when 1st is torn up for contruction. The tunnel is a state entity. No puny city construction will tell it when to toll. 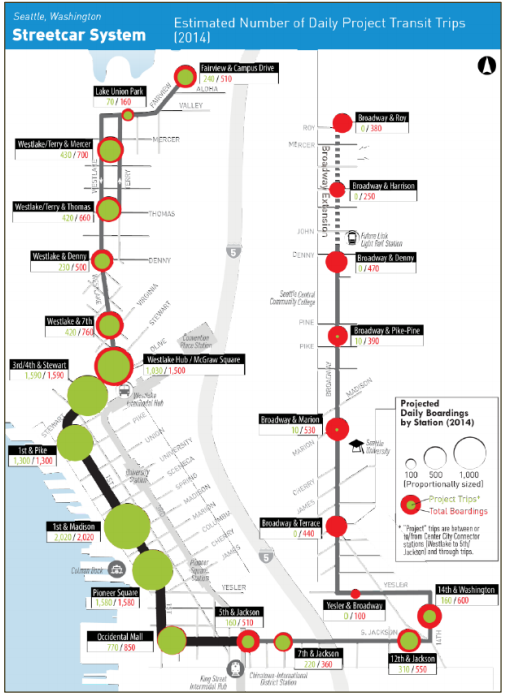 Interesting that the estimated project trips map shows that the CCC helps the SLU streetcar quite a bit, but makes almost no improvements whatsoever to the First Hill line beyond 14th Ave. It’s telling that the city’s models are saying that the network effect doesn’t apply to the Broadway configuration. It’s important to also note that the forecast is seriously out-of-date — ignoring both new frequent service for RapidRide C as well as some of the many unanticipated new buildings in the corridor. Someone should be on top of making new forecasts. Exactly. the whole thing is absurd, for the reasons already mentioned. They are ignoring the rest of the system, and assuming that buses couldn’t possibly do the job. There is only one unique part of this, and it is the First Hill Streetcar part, and building this new line doesn’t make it better. If you are trying to get up to First Hill from anywhere on the new line, then it doesn’t make sense to use the streetcar — you will just take a more direct bus like the 3/4, or Madison BRT. It only makes sense to use the streetcar for the segment that is already built — everything else is redundant. We build the streetcar track, with the transit only lanes. At the same time, we continue work on the RapidRide+ projects. It becomes obvious that one of the ways we can help out a couple BRT bus routes (and the transit system as a whole) is to send those buses on 1st, on the same tracks as the streetcar. Great, wonderful. Proponents celebrate, while opponents can at least say we got something out of the deal. Next thing you know, ridership *within downtown* is the same for both the buses and the streetcars on this path. Of course it is. If the bus and streetcar follow the same path, and both are as frequent, then you simply take the first available vehicle if you are traveling between South Lake Union and Jackson. Except that ridership *on downtown stops* would actually be higher for the buses. If you are headed outside downtown, then you will prefer the bus. So someone would never wait for a train, but they will certainly wait for a bus. Meanwhile, you have your share of bike accidents, because, of course, they never actually did any mitigation, other than to say “don’t bike there”. Eventually, if the city keeps growing (and it likely will) then headways on the RapidRide buses increase. You get bus-streetcar bunching. People begin to sour on the streetcar, wondering what the point is, since it is basically just getting in the way of the more popular bus routes. At that point, maybe we’ll pave over the rails and sell the streetcars to some other sucker city, unless the streetcar fad has become passe. It’s interesting that both this model and O’Brien’s recommendation acklowledge what we’ve been saying for years: the Broadway-14th-Jackson routing is too indirect to be much of an attraction, and the city really needs to upgrade the SLU and FH corridors so that the streetcars have enough priority to move people at faster than a walking pace. If there was a way to get the FHSC to Judkins Park or maybe Mt Baker (via Jackson and 23rd, or via Jackson and 20th or via Rainier) it would attract lots more riders. Then, Jackson streetcars could go to 23rd like it was supposed to do in the original streetcar plan! I would rather be spending my tax dollars at turning SLU towards Belltown, or turning SLU to a one-way Pike/Pine loop to 12th Avenue, too. It’s a timing tragedy and we’re marrying a streetcar alignment even though the goals, values and mutual benefit were questionable at first and now counter-productive — just because the couple would look so cute in the wedding photos. The routing is the worse part. It is what makes the entire project ridiculous. Put aside whether it makes sense as a streetcar route — it doesn’t make sense as a bus route. We have nothing else like it in our entire system. It is easy to complain about Metro, but give them some credit for never producing a bus route as ridiculous as this. Just to be clear, we have short, urban bus routes. The 47 is a very tiny route. But it doesn’t double back on itself, or make ridiculous button hooks. Taking a ride anywhere along the way makes sense. That isn’t the case with this route. From First Hill to any of the new stops will be better by bus. Of course it would be better if the streetcar wasn’t stuck in traffic. But moving it will become extremely expensive. That is why this is such a horrible choice. 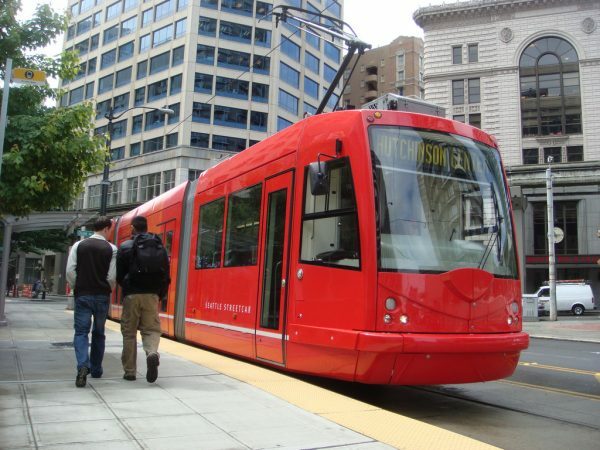 Imagine if we really did have a good streetcar route — say the 7. At some point, we would want that streetcar to move faster, and to do that, you could run the streetcar in the middle of the street. Except that costs way more. Well, the same is true for this streetcar line. They could move to 12th (instead of Broadway) and convert a parking lane to a transit lane. To do that will cost a lot more, because this is a streetcar, not a bus route. An even simpler, small fix would be to get rid of the button hook by skipping the stop on 14th. Have this turn on 12th instead. This would be a trivial change if this was a bus (you just need to notify everyone) but becomes really expensive for this streetcar. Each streetcar was a bad idea. Now it remains to be seen how much more good money we will put after bad. OK, fair enough, but that was a coverage route. They didn’t sink millions into preserving it, or pretend that it was actually a vital part of their network. After all, they did kill it. To be fair, Mike: Yes, we’ve been saying the SLU/FH corridors should be improved for years. But the CCC LPA has also been out for years (2014), and always included improvements to those existing segments. And don’t forget about the short, but time consuming detour that the route 8 takes from MLK over to 23rd on Jackson, only to head back to MLK on Yesler. The best part of 23rd Ave construction the last two years, was that they didn’t take the jog over and back. I had hoped that Metro would see how much more efficient the route was staying on MLK, but alas, no. It’s gone in Metro’s LRP. The detour is turned into a jog, as Madison/MLK – MLK – Jackson – 23rd (Judkins Pk stn) – College – 17th – Beacon Hill stn. That’s several turns but it keeps going westward so it’s not backtracking. It depends, if you’re already down on 1st or below, like getting off a ferry or by Pike Place or the heart of Pioneer Square, no way you’re walking up the hill to 3rd to catch a bus to go to SLU. But If you’re on 3rd or above, you’d probably just catch the C. 2nd–it’s a wash, I’d have to check the tracker. Of course, if left-side door busses did share the streetcar lane and one of them came first and I was just going a few blocks down the road, you bet I’d hop on that bus! Of course, another factor not accounted for in the previous study: the housing crisis literally pushing people across the Sound! A bit of shameless selfishness here as I may end up being one of them in the near future. Anybody got figures on fare recovery between pay toilets and the Metro Water Quality division? Like any public utility, a streetcar line can be done well or badly. And whatever needs work on existing segment, equipment’s available. Which will be a world easier to get when these lines become part of a connected citywide system, of which planned First Avenue line will be an excellent part. Proud of Seattle City Council for keeping the work alive. Would be good to reinstate a classic transit ceremony: Mayor gets to drive the first train. From personal transit-driving experience, I think Nikki Oliver could deliver a better maiden voyage than the other two maidens in the current race. But revival of the George Benson line should be perfectly-timed photo op for her. Congratulations to Transportation Choices Coalition for pulling out a win. That’s all I’m saying as I don’t live in Seattle and prefer light rail to electric bus to streetcar. Pete, life time-frame of the streetcar system that all three of these streetcar lines will be part of will be plenty of time to get present problems fixed. Even if the Broadway line remains a “spur”, its neighborhood will only become more streetcar-demanding, let alone friendly. Among all the street rail I’ve seen, Broadway to Jackson to First to South Lake Union (and beyond) will be the most attractive to ride. And window-shop, and market lunch-visit. Broadway especially, but not only place, traffic conflicts will be solved by having streetcars exchange priority with trucks and cars. Reserved lanes and transit-first signals an easy given. But I owe a cringing apology about my ranking of the three transit-operator applicants I named. Ancient Greek WWIII got started when a young temp had to judge a beauty contest between three gorgeous women with connections, and insulted all of them. What I really meant to say was that I think Nikki’s chief qualification for Mayor is being comfortable in the the exact brutal working conditions that Cari has spent her whole gracious life working never to deserve. But. “Operator Durkan. A Fare Dispute is a serious infraction. Fortunately your excellent work record certainly entitles you to retraining, after some anger-management counselling. But locking up five of the perpetrator’s friends a block from Angle Lake Station even though they weren’t even on the bus because they wouldn’t rat on him? As your Base Chief my hands are cuffed, I mean tied. Per standard penalty by Contract, you report tomorrow morning to your new assignment at Bellevue Base. I’d disagree that the current Broadway alignment will get substantially better over time. – The development activity in Capitol Hill behind generally either 1-2 blocks east or 1-2 blocks west of Broadway. Broadway is mostly already fully redeveloped except for around the Link Station (which will be more attractive using Link) or Yesler Terrace. – The wait time for a streetcar rivals the walk time to Link or the wait time to a Downtown bus or a Link entrance, and is often worse. – The number of retail storefronts on Broadway is fairly limited as medical buildings, Seattle Central and Seattle U take up at least 60 percent of possible storefront space. We need to grow up and admit that it’s not just traffic congestion that creates the FHSC low ridership. It’s the land uses on the alignment itself. Not to mention the ridiculous routing. A transit line that goes straight is almost always going to be more popular than one that takes a 90 degree turn, because it not only works well for folks headed that way, but those making a transfer. There are exceptions, of course, where the main road makes a turn (like Rainier that becomes Jackson) but that clearly isn’t the case with the streetcar. But this route not only takes a 90 degree turn, but actually does a complete 180 button hook! That kind of routing will kill ridership, because there is often a faster way to get there. Even as a means to run along Broadway and connect to downtown it is bad. The logical route for a route like that is to turn on Yesler, then continue south, connecting to one of the many buses serving the south end. As it turns out, that is what Metro proposes as part of the One Center City project (more or less). Like everyplace else in Seattle….Broadway has not yet begun to urbanize. The boat yard and the oil company and all those machine shops were heavy industry to beat Detroit. And like the grocer in Lake Wobegon, if they didn’t have it you probably didn’t need it. So only downside will be that nobody reading this will be able to afford to live there. While it won’t take a major capital investment to get cars out of the way of streetcars, Capitol Hill Station will handle Northgate, Downtown, and Tacoma. While Subway #2 will serve The Thing That Ate Ballard. This is a visiting tourist streetcar ride. The kind the Kirkland Connector should be if anybody could do the mining incline at South Kirkland Park and Ride. The Neighborhood Association’s grandkids will love it. Anyhow, you don’t have to ride it. 1st Ave reliability will be impacted by blockages on both Westlake and on Broadway. The sum of the reliability problems will be more painful than the parts. We may as well spend a few million dollars more on a few more streetcars, and make the whole line One Center City Connector, with 5-minute headway the entire length of the line. Nothing short of that will make the streetcar attractive to light rail riders who might transfer to the streetcar to get to First Hill. Or we could just run the buses more often. Actually, since the buses are faster and fairly frequent to just about every stop, it is the better choice in almost all cases. The one exception is Yesler, because the 27 is so infrequent. But if the 3/4 were moved there, that would leave only the stop at 14th. You could serve that much better by running a new route that went straight across Yesler, then south on 23rd, thereby plugging a big hole in our high frequency network, while connecting it to Link (at Judkins Park). By “big hole” I don’t mean physically big, but I mean that there are lots of people close to Yesler without a high frequency bus nearby (much of Jackson doesn’t have that either). That is a long way of saying that nothing will make this attractive more attractive than a bus to light rail riders trying to get to First Hill. Apologies if this is a dumb question, but once the CCC is completed is the plan to have a single streetcar traverse the entire connected “line” from Broadway to SLU or will riders have to transfer between lines at Pioneer Square and Westlake? I’m assuming it’s the former, but I’ve learned it’s never a good idea to make assumptions where SDOT is involved. I thought I recall reading a few years ago that the connection at Westlake was logistically challenging/impossible, but maybe that’s been resolved (or I’m mis-remembering). I’m assuming/hoping that that turnback on Republican St has a layover and stop as well. Otherwise it’s weird to have it go all the way up there just to turn around and go back without stopping. Plan is for half the cars to run SLU-ID, and the other half to run Westlake-Broadway. Thus, tails get less frequent service and downtown gets more frequent service. Wait, what? This just gets worse and worse. I am not doubting you, but that sounds terrible. If I’m standing at Pike Place Market, and want to take this to South Lake Union, half of the streetcars won’t go there. That just sounds crazy, when the C actually ends at South Lake Union. The could have easily ended the C at Westlake, or the Convention Center somewhere, but decided (for good reason) that it made sense to extend it up to the lake. The same is true if I’m going from Pike Place to 12th and Jackson. That is another very reasonable trip (unlike going up First Hill). The ridership estimates, and in turn the fare recovery rate are based on the idea that frequency will drive ridership. This will be the fastest, most frequent option around, so people will take it. But it obviously won’t be, at least for most of the trips. The frequency is for all those tourists at Westlake and Pioneer Square who want to go to Pike Place. That’s supposedly a large number of people because people keep telling me there’s a lot of unmet transit demand on 1st Avenue and the 3rd Avenue buses aren’t close enough. Surely you knew the operating plan. I’m not sure exactly when the article was, but STB had a long article perhaps three years ago outlining it. Maybe you weren’t reading regularly then, but it has never been the intent to run from Fred Hutch to Broadway. Westlake to the ID is the core of the route. Mike, For a tourist headed from The Market to Pioneer Square, “watch out!” More than half the buses that pass 3rd and Pine southbound turn off somewhere before Washington Street. It’s not so bad headed north, but you have to go to the proper stop and a good number of the buses that stop between Jackson and Main continue on Fourth rather than making the jog over to Third. Ross’s vaunted “flexibility” is no big deal for residents; they get on the wrong bus once and never get on that particular one again. But for tourists it’s a definite source of concern. I very much hope the separation into two “lines” is not set in stone. Is there any logical reason to break it up and pretend it is two “lines?” Especially since based on the operating plan the SLU “spur” section is literally only the last 3 stops and the turn around at Republican St looks weird if not time wasting. Even if nobody’s riding end to end, you’re just creating unnecessary confusion. What I could see is having every other train go all the way up the hill to Broadway, esp. if that section has lower ridership. Two lines is what gives you the 5-minute frequency in the middle, which is section that’s highest-ridership and most visible to tourists. Running end-to-end requires extending each run by a third, which requires either more money or dropping the frequency from 10 to 12 or 15 minutes. The streetcars are currently 15 minutes, at least off-peak, and people are walking rather than waiting seven or thirteen minutes for them. Not confusing at all. Streetcars are one “line” with two different and alternating destination signs. In each direction. Odd to read some of these comments from supposed transit sophisticates. The Broadway portion provides unique mobility benefits, and will do more so when Yesler Terrace is built out and/or they figure out some signal priority. The Jackson segment could be useful as an upgraded #14 out to 23rd or MLK or something. The only thing the stupid 14th/Yesler buttonhook should ever be used for is non-revenue moves between the “Broadway line” and a future “Jackson line” or “Rainier line”. Oh, and why have we never even considered building for multiple car consists? I’m guessing that artic trolleys can carry far more than a single streetcar. >> I’m guessing that artic trolleys can carry far more than a single streetcar. They are roughly equal. I looked into, and checked various sources, and they are basically the same. It gets complicated, because there is no common standard (e. g. square meters). Seat configuration has a lot to do with it, and then you have estimates based on how many people can fit in a square meter. I also looked at the size of the vehicles. The streetcars are slightly longer (bumper to bumper) but have two driving compartments. The buses are a few inches wider. All in all, no matter how make the estimates, they are very close to identical. The 9 has virtually the same route on Broadway, as does the 60. The 9 is so infrequent, though, that it gets ignored. Speaking of which, was the 9 always so infrequent? Anyone know the history (Mike)? The 60 is fairly frequent, but differs between Madison and Yesler. The streetcar makes a weird button hook to serve 14th, while the 60 makes 45 degree turns to serve the hospitals. Both the 9 and the 60 extend farther up Broadway, making them clearly better. The only unique thing about the streetcar from a mobility standpoint is that it connects parts of Jackson with parts of Broadway (with one seat). If the 3/4 are moved to Yesler (which seems likely) then you will have something similar on Yesler. Connecting two areas like this, in this manner is wasteful, and rarely worth it from an operational standpoint. It goes against the grid, and makes it difficult to actually improve it. When I look at a transit map of the area, one of the big things that jumps out at me is that the service on Jackson and Yesler is so infrequent (every half hour). Imagine if instead of trying to connect two stops on Jackson with Broadway, we just ran buses on Yesler, Jackson and Broadway a lot more often. When I started riding Metro in 1980 the 7 and 49 were one route called the 7, although the part between downtown and Columbia City was more frequent. I don’t remember when the 9 and 60 started. The 9 may have started with the DSTT/Campus Parkway reorganization in 1990. It was like the 7 but bypassed downtown, going from 45th to Broadway and Rainier to Rose Street (juust short of Rainier Beach, for some inexplicable reason). It ran weekdays, maybe every 30-60 minutes. The 60 was I think half-hourly from Broadway to Georgetown. I read that its 9th Avenue detour was requested by First Hill residents, so that the mobility-impaired would have closer service to the center of the neighborhood and Harborview. I was surprised when the plans for the streetcar and a north-south route came up, that there wasn’t more push to get those on 9th. Later the 9 was deleted. Then it came back as an infrequent express between Broadway and Rainier Valley. Then in the 2016 Capitol Hill restructure it was reduced to peak-only. I expected it to be deleted then; I wonder how long it’s going to last. Walking from Jackson to Yesler to catch a bus to go up the hill isn’t going to cut it. It’s a VERY steep slope from Jackson to the bus stop at Yesler and 6th, and 4th and 5th would involve stairs to get on to the bridge, and 3rd is too far out of the way. This is really good news. I’m happy that at least this is going forward. Hopefully the data will show it as successful and we can then move forward with more. Woo-hoo! The first step to curtain tolling downtown. Add it to I-5 exits and all the way across Dearborn and you’ve got yourself a nice little revenue stream from the suburbanite autoistas. What’s not to like? Thank you, Mike O’Brian, for proposing to put some real money into evaluating decongestion tolling on downtown streets. I have supported decongestion tolling downtown for years, since I learned that a change to state law allowed cities to implement it. The basic problem of car gridlock downtown is that the freeways and freeway exits have less capacity than the streets or the parking supply. To keep everyone able to move downtown, some rationing of car access is needed. I realize that money is only one way to ration; lotteries and free income-restricted toll passes can be used to mitigate the equity impact of tolls. Once all the planned transit is built, we will have 4 transit hubs and possible transfer points along Madison. Ferry, CCC at 1st, 3rd BRT, 5th Light Rail (assuming that is the station for the 2nd tunnel). We really should consider building a Hong Kong style escalator alley. That is not an easy hill for transfers. It’s probably a pipe dream but I’d imagine Western to 6th Escalators would also be an attraction. There will be one or two more escalators from 1st to the waterfront as part of the waterfront project. You don’t need escalators south of Spring to get to the waterfront. The walkway to the Ferry Terminal is level while Madison and Marion descend slightly to Western mostly by ramp. The G Line/Streetcar station will be between Madison and Spring. Any escalators need to be east of First Avenue. They should be along Marion with level entrance to the Midtown Station from just west of Fourth Avenue. Related question: Presumably the Marion St. walkway is going away with the viaduct demolition. Is there any plan to reconstruct it? As part of the Waterfront reconstruction….the Marion St Walkway is to be rebuilt and widened, I believe.